How to add CNAME records in DNS manager? The first step in adding a DNS record is finding out who is your DNS provider for your domain name. Usually it is your domain registrar or your hosting company. You can use DNS Dig Tool to find out your DNS provider easily. 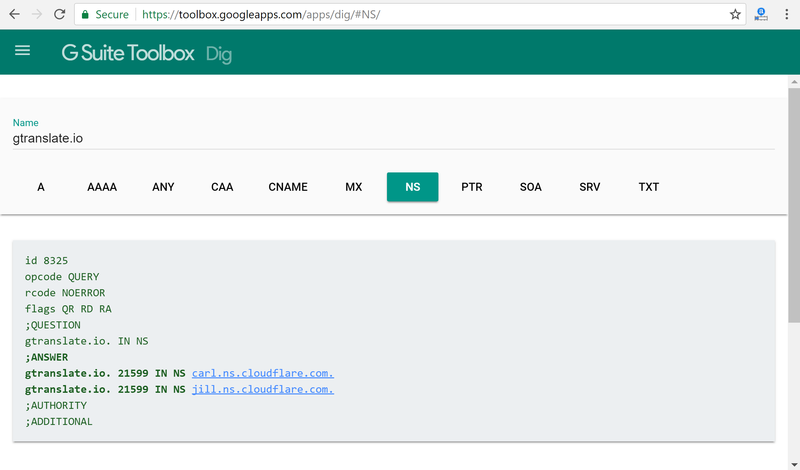 As you see from the screenshot above for our domain name we use Cloudflare. For your case it may be domaincontrol.com (GoDaddy), systemdns.com or googledomains.com if you bought your domain with Shopify, or some name related to your hosting company which will hint who is your DNS provider. Below you will find the steps of adding CNAME records in Cloudflare, GoDaddy, Shopify and hostings with cPanel. Login to your account at cloudflare.com account. Select the DNS settings tab on top. 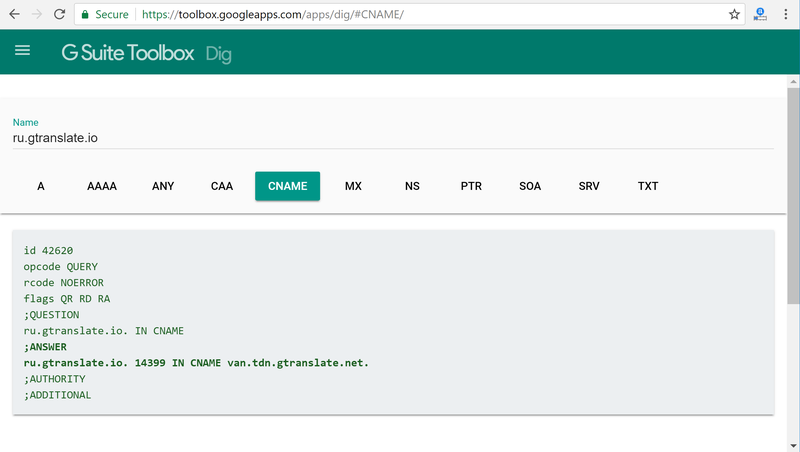 Add the CNAME record to point language code to GTranslate server name mentioned in your instructions email. Make sure the Cloud icon is turned off to bypass Cloudflare. Log in to your account at godaddy.com by clicking the My Account tab. Under the All Domains section, find your domain you want to configure and click on the domain name link to open the domain settings page. Open the Manage DNS link on the bottom of the domain settings page. Click on the Add button under the Records list in DNS Manager. Set Host to the language code you wish to add. Set Points to to GTranslate server name mentioned in your instructions email. Under "Add a CNAME Record" section set Name to the language code you wish to add and CNAME to GTranslate server name mentioned in your instructions email. Click Add CNAME Record button. From your Shopify admin, go to Online Store → Domains. In the domains list section, click Manage. Click DNS Settings on top of the screen. Click Add custom record and select the CNAME record type. Set Name to the language code you want to add and Points to to GTranslate server name mentioned in your GTranslate app. To verify that the CNAME record was successfully added you can use DNS Dig Tool. If everything is done properly you will see the GTranslate server name in the Answer section. Note: If you are having issues finding your DNS manager or adding CNAME records in your DNS manager, feel free to contact our Live chat and we will help you.